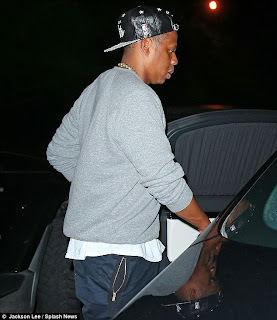 Last night the power couple that consists of Jay-Z and Beyonce stepped out on the town for their ace Kanye West's birthday party! Both looked chicly casual and appropriate to step out on the town. Beyonce is wearing a seasonal fashion staple of black and white horizontal stripes in a Topshop crop top and midi skirt two piece. Paired with the fun colored coral pumps and lipstick. Jay-Z is channelling his laid back grown man vibe in leather baseball cap, sweatshirt, loose fit athletic style pants and I love it!